Field Part of the BC Adventure Network. Over a million web site visitors annually ! 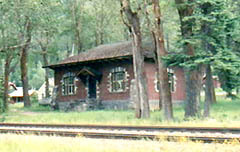 Field is home to 300 inhabitants, and was established in 1885 with the building of the Canadian Pacific Railway. The community was named after Cyrus W. Field who was a promoter of the Trans-Atlantic Cable. The CPR was experiencing financial troubles at the time, and he visited the community at the invitation of company officials who wanted investment money - he didn't invest. 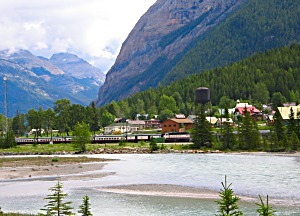 Located at the foot of Mount Stephen, in the heart of Yoho National Park, the community of Field is on the banks of the Kicking Horse River and the Trans Canada Highway. Field is still a divisional point for the CPR, and also serves as an administrative post for Parks Canada. Recreational activities in the area include mountain climbing, hiking, cross-country skiing, fishing, ice-climbing, horseback riding, and canoeing. Takakkaw Falls - Spectacular 254 metres high waterfall, access to hiking trails of the Yoho Valley. 13 km road is steep with switchbacks, open during summer only. Natural Bridge - where the Kicking Horse River has carved a natural bridge through solid rock. Burgess Shale - Field Visitor Centre display of fossils over 500 million years old. 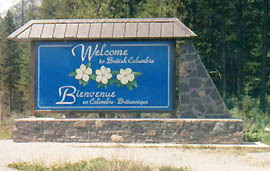 Field is the first community on the Trans Canada Highway to welcome visitors to BC. Weather in the area is localized and changeable. Summer weather extends from mid-June to mid-September. The mean temperature during this period is 12.5 C, with average highs of 20 C and lows of 5 C. Above 1500 metres, freezing temperatures and snow are not uncommon in the summer. Temperatures will range from +10 to -35 degrees celsius from November to April although the average is -5 to -15. Daily weather forecasts are available from the Visitor Centre and Campgrounds.